Since I first reviewed Brushes for the iPhone, the app has matured nicely, expanding the list of brushes available and adding the ability to use multiple layers in your paintings. Continuing that trend, Steve Sprang has released Brushes iPad Edition, giving us even more of the good stuff we crave. Brushes iPad Edition is the most feature-rich release of the popular Brushes application so far. There are 19 different brushes for you to paint with, ranging from the hard- or soft-edged round brushes to some nice texture brushes made of dots, lines or splotches. You can control the size, spacing, and transparency of these brushes by manipulating sliders in the brushes window. There’s also the option to have each brush vary in size and opacity depending on how fast you paint with it. All of these brushes and options apply to the eraser tool as well. Multi-Layered: On the iPad, Brushes supports up to six layers. That’s two more than what the iPhone version of the painting app offers. Once you’ve chosen your brush, you can pick a color to paint with using a full-spectrum color wheel complete with sliders for manipulating the color’s transparency and how light or dark it is. To the right of the color wheel are swatches that you can use for quick color selection. You can also drag any color from the color wheel to a swatch, and it will be saved for later use. The eye dropper tool allows you to select any color already on the canvas, and a paint bucket tool will completely fill the screen with your selected color. Brushes gives you a nearly unlimited amount of undos, so you can paint away without worrying about making mistakes. Brushes iPad Edition supports up to six layers—that’s two more than the iPhone version. The layers window offers all sorts of great options. 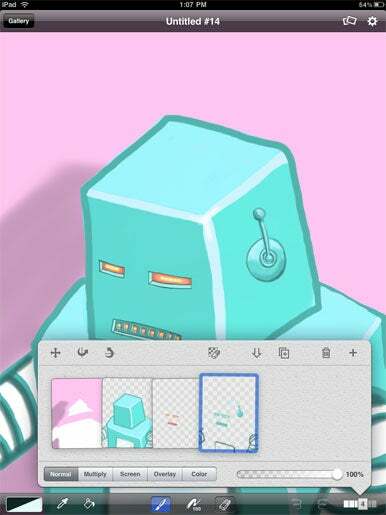 You can flip a layer horizontally or vertically, clear the entire layer, and merge a layer down into the one beneath it, as well as duplicate, delete, or create a new layer. You can also re-size, rotate, and reposition a layer at any time. You can import photos saved on your iPad as new layers as well. A slider controls each layer’s transparency and even the ability to select a layer’s blending mode. You can pick from five different blending modes—Normal, Multiply, Screen, Overlay, and Color. These blending modes affect how a particular layer interacts with the other layers. For instance, Screen mode ignores the color black and only lets the lighter side of the spectrum show up, while Overlay is a good choice for textures since it nicely blends with the layer beneath it. These blending modes work just like they do in Photoshop on a computer and open up new possibilities. You can also rearrange layers by dragging them around. Once you’re finished creating your masterpiece, you can save it to the gallery. In the gallery, you can swipe through all of your paintings, which are framed and hung on a wall with a small info card below them containing the title, artist’s name, and date of creation. From here you can watch a video playing back each painting as it was created, stroke by stroke. You can also share your creations via e-mail, upload the image to Flickr or just copy or save it to your iPad’s photo library. Brushes iPad Edition is a fantastic painting app. With all the new features and the large screen of the iPad, it’s one of the most intuitive and exciting ways to paint or draw. If you’re an artist or just a creative person, you should really consider downloading this application.